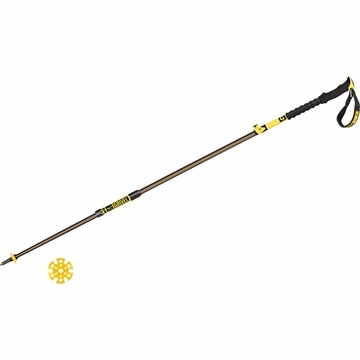 "Grivel introduces its new range of poles. They are versatile, durable and four-season, suitable for many activities in the mountains: from trekking to trail running, from ski touring to alpine trips. All shafts made in aluminum 7075 for optimal resistance to weight ratio. All come with summer and winter basket. The Trail family (1-section, 2-section and 3 section) features an ergonomic EVA FOAM LONG GRIP for comfort and breathability, and a removable strap. Size: Adjusts from 112 cm to 130cm / 44in. to 51in. "